To help understand some of the terms used to describe Ballroom Dance, we have included links to Wikipedia definitions where applicable. 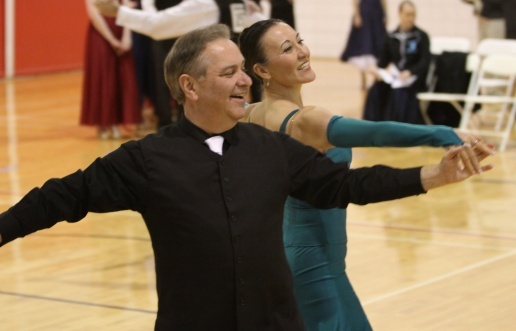 John and Penny Participate in a number of DanceSport Ballroom Competitions. They compete in International Style, also known as "Standard" and "Latin", American Style, also known as "Smooth" dances as well as American Style Rhythm dances. 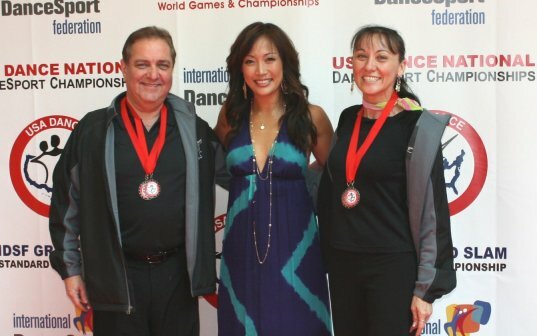 American Style is taught in most social dance studios in this country. International Style is what you see in most major competitons around the world and on Dacing with the Stars. Currently John and Penny compete in Foxtrot, Slow Foxtrot, Waltz, Tango ,Quickstep, Viennese Waltz, Rumba, Cha Cha, Swing, Samba, and Jive. Competitions have different levels and age groups. The 1st 3 levels are Bronze, Silver and Gold. These are the syllabus levels where dancers are restricted to steps within the syllabus. The next levels are called "open". These are the non-syllabus events where the dancers are not restricted and are able to use advanced choreography. These levels are Novice, Pre-Champ and Championship. We decided to compete in American Style Rhythm again. We had not done so since 2012. We reached a milestone in our competitive dancing. For the first time, we danced a championship level event in a National Championship. 1st Place and National Champions in Sen. IV Pre-Champ & Novice International Standard, as well as Gold and Silver Latin. 1st Place in Senior III Gold & Silver Latin. 2nd Place in Senior IV pre-champ American Smooth. 3rd Place Senior III Championship Smooth. Our first time dancing Championship Smooth as well as Silver Latin. 1st Place in Sen II & III Bronze Latin. 2nd Place Sen II Silver Latin. 1st Place Sen. III Silver Latin. Our best showing at Nationals to date. We are happy to say that we are now 5 time National Ballroom Competition Finalists. To qualify for Nationals you had to place in the top 65% of a regional competition. Carolina Fall Classic (USA Dance National Qualifier) October 4, 2014 Once again we were very pleasantly surprised with our results. This was our first time dancing in PreChamp for Smooth and Standard. It was also our first time dancing Latin. Gumbo DanceSport Championships (USA Dance National Qualifier) June 28, 2014 Our results were a real surprise. This was our first time dancing Standard Novice. We are now qualified in all events for the 2015 Nationals. We are proud to say that we are now 4 time National Ballroom Competition Finalists. To qualify for Nationals you had to place in the top 65% of a regional competition. Carolina Fall Classic National Qualifier - Charlotte NC - October 4-6 2013 This competiton was a big surprise. We returned to the competition floor for the first time in a year and a half since John's foot injury. It was our best competition to date. We danced 55 times in 3 days. We are proud to say that we are now 3 time National Ballroom Competition Finalists. We were really impressed with the number and level of dancers competing at the National Competition this year. The level of dancers has really risen. It was the largest Nationals yet with over 1200 competitors that had qualified. In order to qualify you had to finish in the top 75% of regional competitions during the year. It is really something to be on the floor with the best amateur dance couples in the country. We were also delighted and surprised with our own results. The final round for each event is limited to 6 or 7 couples. To make the final round you have to get "called back" from semi-final or even quarter final rounds depending on how many couples are in the event. We figured that we danced 53 times in two days. We danced Waltz, Tango and Foxtrot in both American and International styles along with Quickstep, Viennese Waltz, Rumba and Cha Cha. This was our first time competing in Rhythm. It was also our first time competing in a non-syllabus event (Novice). 1st Place Senior III Bronze Rhythm. Well, I'll say again we were so surprised and pleased with our results. We had large fields of competitiors, as many as 19 in some. We qualified for Nationals in all of our events. Once again, we obtained national titles and did much better than we had hoped. With all the best amateur ballroom dancers in the country competing we just felt privileged to share the same floor. 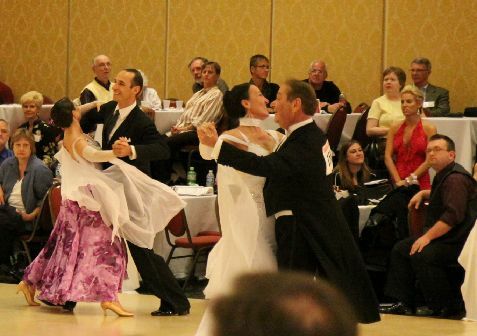 There were about 1500 competitors dancing for three days in all categories. Dancing started at 7 in the morning and went to midnight most days. We were usually up at 6:30 to try to get some practice. We competed in American Style "Smooth" and International Style "Standard". We competed at the Silver and Gold levels and in two age categories, Senior II (ages 45-55) and Senior I (ages 35-45). Depending on the event, we had to make our way through quarter finals (sometimes multiple times), semi finals and finals. 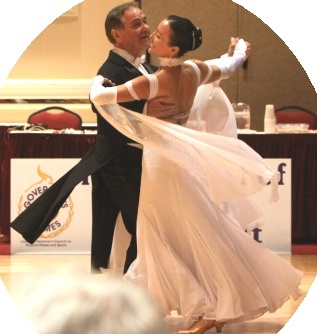 "Smooth" dances were Waltz, Tango, Foxtrot and Viennese Waltz. 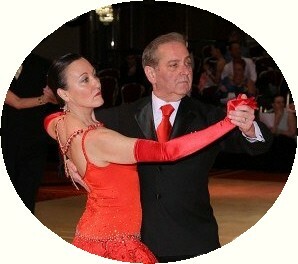 "Standard" dances were Waltz, Tango, Foxtrot and Quickstep. 5th place Senior I Silver Smooth. Standard: Made the semi finals (top 12 couples) in all events but did not place. We were thrilled with our results. Mid Atlantic Championships - Bethesda MD - Feb. 2011 This was our first time competing Gold. The International Viennese was an Open Event (open to all ages and levels). We started with 17 couples. Me made the quarter finals and semi-finals. The final round had 6 couples on the floor including our coaches. We took 6th place. We made the final round in all of our events. Gumbo Dancesport Championships 2010 - Baton Rouge Louisianna "We were very pleased with our results among all these great dancers. The biggest surprise came with our results in Viennese Waltz. These were "open" events. Open to all ages and levels. We were competing directly with a number of championship level couples." This was also a qualifying event for the 2010 National Competition. They also competed in Senior I & II Bronze Standard events. They did not make the final round in those events. 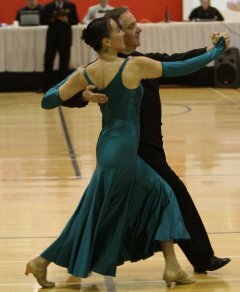 The 2009 Triangle Open Ballroom Competition. USA Dance National DanceSport Ballroom Competition April 2009 in Baltimore MD. Photos and Videos of selected competitions can be seen on the main page.